Still sticking with paleo (I suppose you might call it “primal” as I still use a bit of butter on occasion), with auto-immune tweaks. My joints still hurt, but not as much as they did before I started this. Other benefits: I sleep better, waken refreshed, have more energy than I did, and am never hungry. In fact, I’m having trouble getting enough calories in. Next time, I’ll post some of my favorite paleo/primal recipe websites. I was a runner at one time. I went from couch potato/non-athlete to runner when I joined the military and had to run a mile and a half in 12 minutes in order to graduate. In addition, there was an award you could earn if you ran an average of three miles a day during the training period, and that was motivating. After I graduated from training, I continued to run three to six miles a day. I was hooked on that runner’s high you hear about. It always took a mile of awfulness to reach it, though, no matter how fit I was. At about the three-quarter point I’d always feel like quitting, as if I couldn’t put one foot in front of the other to save my life, and yet I did. And then I’d hit the mile point, and all of a sudden it was effortless, I could run forever, I couldn’t feel my feet touching the ground — was I flying? After the babies started coming I went from running to walking. I did a lot of walking, racking up Volkswalk kilometers every weekend. We had dogs all through the years, and the dogs needed walking. And then, a few years ago, something happened. My knees went out on me. We completed a three-mile Volkswalk as a family, and by the last mile I was in agony. I haven’t Volkswalked since. I did a little walking (still with the dog) since then, anywhere from 1/4 mile to 2 miles a day, but my knees got really bad this spring, even with the water kefir, and now it’s a struggle to walk 1/4 mile. I walked half a mile this morning, and I think my knees are done for the day. I’m still hoping this Paleo thing will help to restore my joints. Hoping. My elbows and fingers seem to be responding well, anyhow. Let’s hope the knees get the message. Anyhow, I had read on some Paleo discussion board about someone my age whose knees had given out — did Paleo (or maybe it was Primal), eliminated inflammatory foods, and the knees came back (against all orthopedist’s predictions). That’s what I’m hoping for! I hadn’t been thinking about running again — I’d be happy just to walk, to be able to be on my feet most of the day and not hurt. I promised on another post earlier that I would tell you a funny thing that happened when I was passing through New Seasons on my way to the meat counter, to pick up more “stuff” to base paleo-style meals on. A wine representative was offering tastes of his lovingly crafted red and white wines (I forget exactly what they were — Pinot? Shiraz? Chardonnay? Since I didn’t taste any of them I really wasn’t paying attention.). Eldest was with me, and stopped to ask for a taste. The man offered me a tasting glass as well, and I said no-but-thank-you, I was trying to follow the Paleo autoimmune protocol. I told him I knew exactly what book he was talking about, as I had just finished reading that book myself. It’s Robb Wolf’s Paleo Solution (affiliate link, just so you know — if you click on it and buy the book I get a little pocket money, and thanks! If you don’t, no biggie). The wine seller told him, and he excitedly said, “I’m doing Paleo, too!” The two of them immediately began enthusing about the benefits they’d reaped and comparing notes about how to “do” Paleo. I felt as if I’d joined some sort of secret club or something. Honestly, all I need is a sign and countersign (oh, maybe I already have one) and just add a secret handshake and I’m in business. If it’s a bandwagon, well, I’m glad I’ve jumped on. Feeling better every day. These Paleo people are on to something. Make that: We Paleo people are on to something. You might or might not recall that I’ve been eating Paleo/primal style for the past three weeks in a desperate effort to find relief for my painful knees and joints. For some reason, the water kefir that had been keeping me pain free over the past year wasn’t working anymore. I had a big dose of nightshades (tomato and peppers) in Monday night’s dinner — was that enough to cripple me on Tuesday? Could be. I was very careful yesterday, avoided all semblance of nightshade (tomato, peppers, paprika, eggplant — which I can take or leave, but the other stuff appears regularly on our table), and woke up this morning in much less pain. Got in and out of the car this morning without a twinge. There’s still a little pain there, in both knees, a sort of underlying barely noticeable occasional ache, but nothing like yesterday, and all the other joints seem to be humming along nicely, which they weren’t, not exactly, yesterday. Just in case, I’m going to be avoiding tomatoes, peppers, and paprika today as well, to see if the improvement continues. Found a great tweak to my go-to coleslaw recipe. Coleslaw is my favorite way to eat cabbage, although the stir-fry cabbage I made last week was pretty amazing. (This, from someone who had a sort of okay-I’ll-eat-it-because-it’s-a-vegetable-and-vegetables-are-supposed-to-be-good-for-you attitude.) The coleslaw sauce recipe came out of a gluten-free cookbook, and was so simple to remember: equal parts mayonnaise, sugar, and white vinegar, whisked together. I ‘d add a pinch of salt and a little white pepper to that. Creamy coleslaw perfection. Okay, so how to make this Paleo friendly? Homemade mayo, check. Raw apple cider vinegar, check. Sugar? I thought about stevia, but didn’t really want to go there. My past experience experimenting with the stuff didn’t seem too promising for this recipe. It made for a flavorful dressing — didn’t even need the salt and pepper. The honey was very strong, and can probably be cut down to a teaspoon or a little more. And of course I’m not eating as much honey as is there in the sauce because when the coleslaw is gone, there’s still sauce left on the plate. So while it’s not exactly cutting out sugar, it is cutting way down, and substituting raw honey (which has its own health benefits). You can read on, or ignore the rest, which is mainly medical musing and a little background as to why I’m doing this “Paleo” way of eating, or trying to, anyhow. Anyhow, have begun trying to eat according to “Paleo autoimmune” guidelines, more than I was when I was just following Paleo guidelines. Something that I hadn’t cut out before were the nightshades (specifically tomatoes and peppers — I can take or leave eggplant), nuts, and eggs. The earlier stuff involved in transitioning to Paleo-style eating as defined by Robb Wolf and other people I’ve been “listening to” (as in, reading books and websites), well, that wasn’t so hard, considering that our kitchen has been gluten-free for over a year now, and over the past months I’ve been experimenting with dairy alternatives as well. As a matter of fact, I had been eating a lot more eggs lately, especially since cutting out GF oatmeal and other GF grains. Eggs are relatively cheap protein, and since we get free-range eggs from friends with chickens they ought to be fairly healthy. However, the increase in joint pain this past week makes me wonder — am I reacting to the increase in eggs in my diet? Need to get a handle on this so I can function again. In case I didn’t mention it before, I tried the medical route the last time my joints, especially my knees, were this painful. All the doctor wanted to do was throw — what are they called? NSAIDs? — drugs at the problem to mask the pain, and then when the damage had progressed far enough do knee replacement surgeries. Don’t get me wrong. I’m glad the medical people are out there and available with some sort of “solution.” I’d just like to avoid drugs (I looked up the side effects of what he prescribed. Scary.) and surgery if at all possible. I thought that the water kefir would be enough — it was enough, for months. But something has changed and so I’m changing my attack plan. If something in my diet is causing the pain, and it’s as simple as changing my diet to eliminate the pain (or cut it way down to manageable levels once more), well then, I’d much rather do that than take pills which significantly increase my possibility of stroke and heart attack and I forget what else. Have been egg-free for only a day — oops, no I haven’t. Mayo has egg in it. Will have to investigate homemade eggless mayo, if such a thing is possible. Sigh. And yet, it’ll be worth it, if it works. Selah (Hebrew: סֶלָה‎, also transliterated as selāh) is a word used 74 times in the Hebrew Bible that means GOD HAS SPOKEN. – it used 71 times in the Psalms and three times in Habakkuk – and is a difficult concept to translate. (It should not be confused with the Hebrew word sela‘ (Hebrew: סֶלַע‎) which means “rock.”) It is probably either a liturgico-musical mark or an instruction on the reading of the text, something like “stop and listen”. Selah can also be used to indicate that there is to be a musical interlude at that point in the Psalm. The Amplified Bible translates selah as “pause, and think of that”. It can also be interpreted as a form of underlining in preparation for the next paragraph. I used to wince at red lights. Okay, I’d more than wince. I’d complain, usually inwardly, but sometimes aloud. “Oh, no!” you’d hear me say. “Not another red light!” And truthfully, sometimes it seemed (or seems) that I’d hit one red light after another. “These lights are so badly timed,” I’d grouse. I’d fret about poor fuel efficiency. I’d worry about being — not just late, but — later. Anyhow, back to the topic at hand. One day, while sitting at a red light, it came to me. Stewing was a poor use of my time. Did it get me anything? (Other than aggravated, that is.) No. Obviously. What if I were to use red lights profitably? How could I use them profitably? The idea of “selah” seemed to fit. I’d heard a definition of “selah” in a sermon some time ago; the preacher had called it a time to pause and reflect on what had just been said (in the Psalm we were reading), or the deep breath before the dive into the next section, or both. Practicing “selah-ness” at red lights has totally changed my driving attitude. Now instead of an “oh, no!” reaction to a yellow light announcing a red soon to follow, I (usually) am reminded that God is there in the midst of my busyness, my hurry. It’s a sort of tug on my spirit, a signal to slow down and think about what’s really important. I’m sure it’s done my blood pressure some good, too. Note: Our family received a free subscription to My Home School Grades for this review. Opinions are our own. No other compensation was involved. To start with, I have to admit that I find transcripts terrifying and the idea of assigning grades, much less keeping track of them, paralyzing. There’s something intimidating about writing it all down. My early homeschool record-keeping took place in fits and starts, books read, narrations, things checked off a list. I can’t tell you how many times I started with the best of intentions, only to sputter out a few weeks into the process. If you were to look at my records, you’d wonder about our girls’ education. Standardized test scores say they were/are getting some kind of education. The younger two have tested at the top of the scale over the years. (Youngest’s final state-mandated test is coming up next year, and she’s very happy to see the end in sight.) Eldest is special needs and always struggled with academics. Frankly, I didn’t worry too much about a transcript for her. Just learning as much as possible was a good goal. I attended an online seminar in creating transcripts, taught by Lee Binz. One of the things she said that struck me is that transcripts are really the way that you communicate with a college that might be considering your student for admission. Granted, none of ours are interested in college right now. They hear about massive college debt, for one thing, and people having trouble finding jobs even with college degrees. None of them is interested in being a doctor, lawyer, or engineer at this point in their lives. Don’t get me wrong, they’re not aimless drifters with no plans for the future. It’s just that their plans don’t necessarily require four more years of academic studies. Still, they might choose to go to college someday. Add to that, they have been learning an awful lot over the years, of history, geography, literature, science, and yes, even math. I think they could hold their own against their peers. It seems a disservice, not to document their learning somehow, and portfolios and transcripts are the current way to do that. What I needed was something easy to use, intuitive, that would lead me gently by the hand despite my intimidation. Okay, more True Confession time here. I did not volunteer to do this review. (Did you know that oftimes reviewers volunteer/beg/plead/submit requests for review products?) I said I’d help out if another reviewer was needed. I really would have preferred, ostrich-like, to have kept my head buried in the sand for another few months of blissful ignorance. Of course, the Lord knew what I needed, even though it was not what I wanted. He knew that I had been slipshod in keeping records, and that putting together a transcript for Middlest to graduate in a couple of years would have been even more agonizing than pulling together her records right now. When I received the link to My Home School Grades with word that I had been picked to review the program, I dutifully signed up for an account — easy! — and started to play around a bit. I entered information for all three of the girls, added a few classes, thought about activities, exited the program, and managed to forget about it until the review deadline was looming. 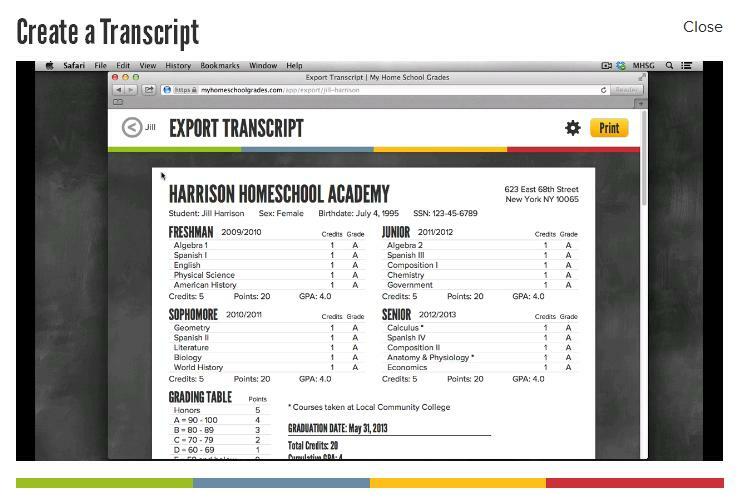 In the meantime, I took Lee Binz’ online transcripts class, which helped a lot with some of my confusion. (Like, how do you record high school level work done earlier than 9th grade? How do you record college-level work done in high school? How do you actually assign credits for work? How do you figure out grades?) Which means, when I finally got back to My Home School Grades I was a little more confident. I added in lots more classes, a whole slew of activities — volunteering, choir, that sort of thing), even… gasp… assigned grades. Mind you, I did all this without even checking out the tutorial videos available on the site. I was able to use the site without the tutorials — the whole thing is pretty intuitive. However, I found (afterward) that the videos are very helpful and gave me a much better idea of the scope of this simple-seeming program. It’s amazing how much you can do! The tutorials currently available show you how to add a student, a class, or activity, and how to generate a transcript from the information you add. 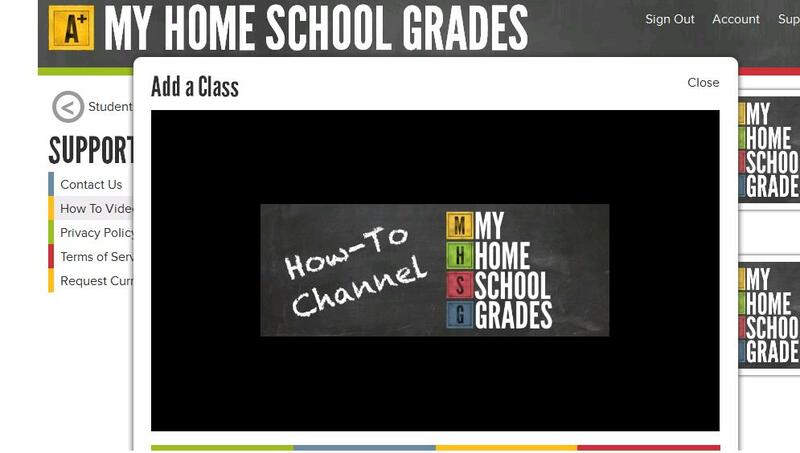 You can watch them at theMy Home School Grades website to get a better idea of the program. 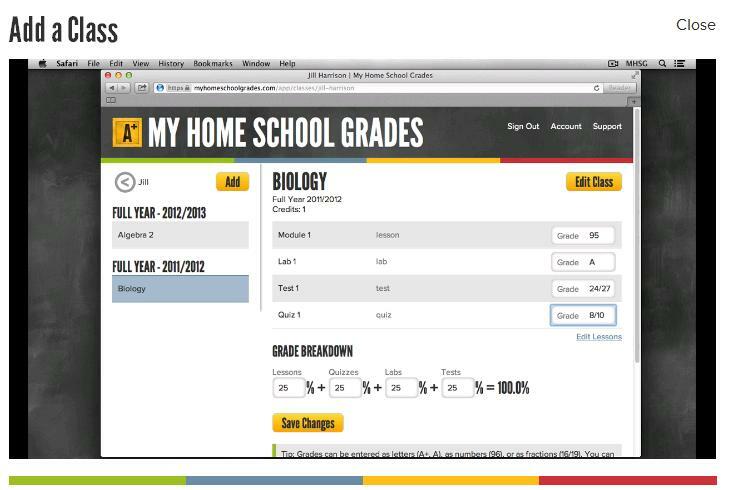 For such a simple-seeming program, My Homeschool Grades offers a variety of features. You can keep a record of your child’s learning from kindergarten through grade 12 (and beyond, with community college dual enrollment). There are several options for adding a class. The lesson plan option allows you to choose a particular curriculum (in which case lessons are automatically added) or a custom curriculum (which allows you to create your own lesson plan). As you can see from the figure above, the program allows you to use weighted grading, in an easy, visual format. You can also add classes that receive an overall letter grade or pass-fail mark, and there’s an option for indicating dual-enrollment where college and high school credit are earned at the same time. Adding activities uses the same method as adding classes — drop down menus, intuitive visual feel. In this way, you can document volunteer work, extracurricular activities, choir, band, sports, 4H, and more. You can choose to include these on a transcript, or leave them off, but in any event, you have a record of activities on file. 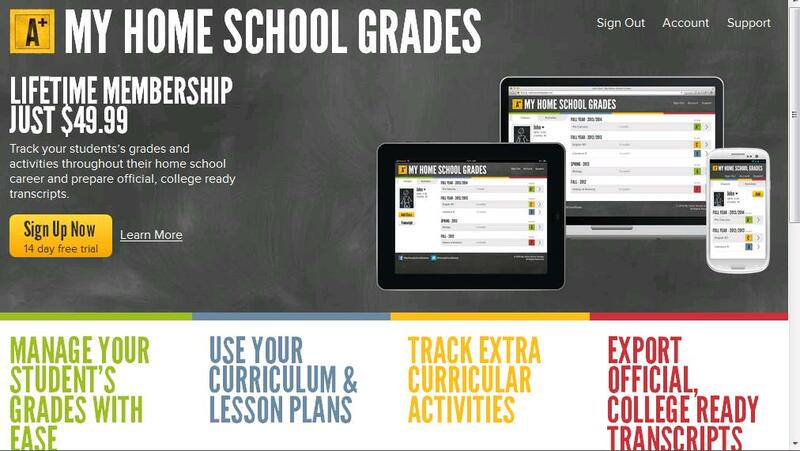 My Homeschool Grades is offering a 14-day free trial, so I urge you to check it out for yourself. A lifetime membership is $49.99 and covers all the students in your family. No matter where you are in your homeschool journey, convenient, efficient record-keeping is just a few mouse clicks away.